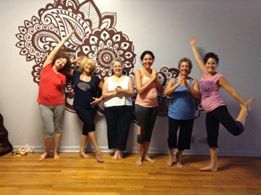 Terri Kim Bowyer has been a long time student and host of YogaFit. 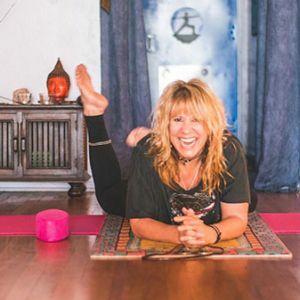 As the owner of Island Lotus Yoga (formerly Merritt Island Yoga Studio), Terri has been a YogaFit host for the last four years. In 2017, Terri finished her 500-hour YogaFit journey. She has a variety of other YogaFit certificates such as 100-hour YogaFit for Warriors and ACE Group Fitness. She is currently working toward the 900-hour YogaFit Healthcare program (formerly Yoga Therapy). 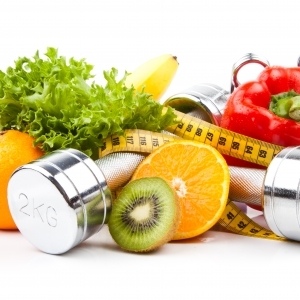 Terri has been a personal trainer and group fitness instructor for 14 years. She got into the fitness industry after working with a personal trainer who helped her lose 100 pounds and reverse Type II Diabetes. 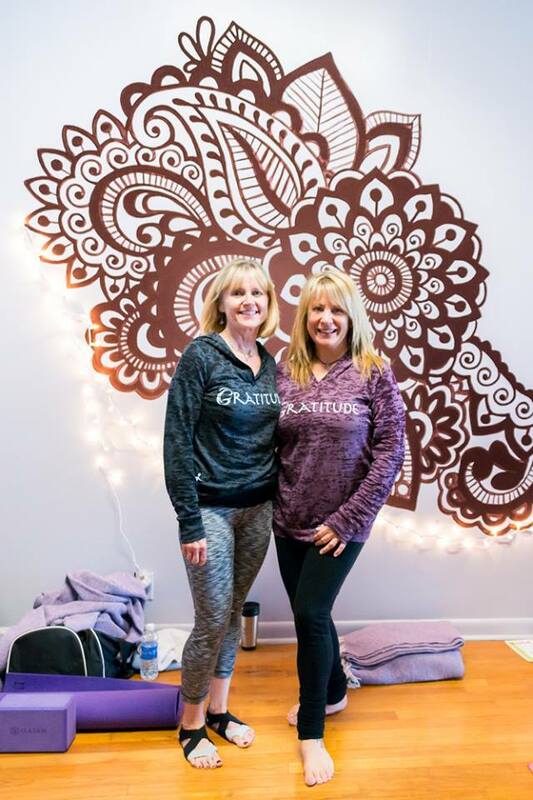 YogaFit: Tell us your story and how you got involved with YogaFit..
Terri: I was so thrilled about being able to take my life back, I was always very petite - to have gained all that weight was a very emotional part of my life. When I lost it and got my power back, I was so excited that I became a personal trainer. Now I’m plowing through my life, strong with lots of energy. Removing alcohol was a huge part of my process of losing weight, and for 8 years, I didn’t drink at all. After only 30 sober days, my clothes became too large for me! In early 2009, I had a spinal cord injury. I thought it was time to find a more gentle approach to my physical fitness, so I started taking yoga classes at the local YMCA. I was in college, so I scheduled all my business classes around my favorite yoga classes. One day some little gal asked me "Are you a yoga teacher? You're SO good." - It was like a light bulb went off and I was like "Oh yeah! That's what I'm supposed to do!" So I immediately started to research - well... How do I become a yoga instructor? Since I was already a personal trainer with AFAA (which I still am), I went to one of their one-day Yoga continuing education training in Tampa. It was not what I needed to do what I'm doing. It simply wasn't enough - I wanted more. There was a girl there that told me about YogaFit and that was it. I was so excited. So many times over the years, I have sat down, written lists planned out my training schedule, these are the ones I'm going to do, these are what I'm taking here, gotta get these in, etc. Fast forward a little bit, when I graduated with 200-hour RYT, I began to realize that 200 hours was just starting to scratch the surface. It builds that foundation for us to go from there. 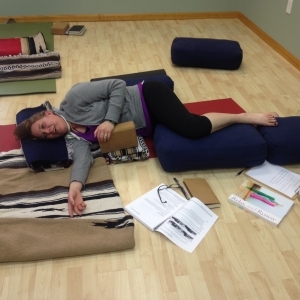 Since 2014, I have been heading in the direction of Yoga Therapy or Trauma-Sensitive Yoga. I had the opportunity for a guest speaking engagement at a local hospital in front of about 30 medical professionals. From that, I was invited to teach in assisted living facilities all over my county - so many that I couldn't teach them all and had to refer out to other teachers! I taught in a variety of different settings: a lockdown Alzheimer's facility, hospice, and another facility that was for recovery after hip replacement surgery. All different experiences, with different people. It was a wonderful addition to my yoga resume and helped me grow as a yoga teacher. Last year for 7 months, although it was a lengthy process, I received a contract with the Wounded Warrior Project - that was a wonderful experience. I am so deeply humbled. My Warrior is an amputee - I have worked with a lot of different demographics with a lot of different conditions. I treat everyone like people. We are all just people. I don't care if your leg is not there. I don't care if you're overweight. You are still a human being. That human connection - just looking into someone's eyes while you're talking to them then validates them as another human, which is so important. I've worked with people that couldn't move, but I could make them laugh or sing - and Hey! That's diaphragmatic breathing! It's always a light spot in any day when someone can make you laugh, even if it's just for a minute. Now I am continuing through the YogaFit Healthcare (previously titled Yoga Therapy) track, and am curious to see where that takes me. In the meantime, I own a small studio, on a small island, and that's been a labor of love. If I can keep the doors open for the community, then that's what I'm doing. I've been involved with this studio since 2012 and I love it. But it is hard work. I would like to hire more YogaFit trained teachers in my studio, so they can teach the group classes and I can do more specialized one-on-one yoga therapy work. Recently, a hospital invited me to teach in their Behavioral Health unit, twice a week for a year-long contract. That's a huge milestone in my journey to becoming a Yoga Therapist. 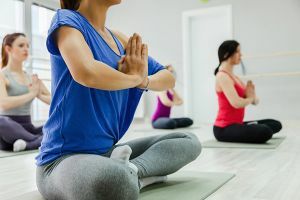 Did you feel like the YogaFit: Yoga as Primary Care training that you took yesterday will be helpful for the work you'll be doing in the hospital? It was VERY helpful. I feel confident now speaking to medical professionals. I feel like we need that training to validate what we're doing as yoga professionals - it's not just "ooh, I teach yoga! :)" YogaFit is a science-based program and during YogaFit Teacher Training we work really hard to learn all of this great information. I will forever be a student. If you go in my office right now, I have manuals and books piled up everywhere - I'm always referring back to them. It's been a wonderful journey. I decided a long time ago, that I was never going to work another job that I hate. Even though sometimes I'm exhausted, I still love what I do and the reason why I do it. We all have a story. If I can share my story and make someone not feel alone when they're having a hard time, then I've accomplished what I've set out to do. What has been your biggest challenge as a yoga teacher? Last September, I was hired to teach a private yoga class for an 8-year-old girl named Katy (name has been changed for her privacy). What a great experience! This was my first opportunity to utilize my YogaFit Kids training and bring a new perspective to my teaching, as well as my life. Katy is such a wonderful kid. She has really helped me overcome my hesitancy to teach a kid’s yoga class. Of course, this has been a one-on-one teaching format, but now I think I could handle more than one kid at a time. Even at 8 years old, Katy is a typical girl — when we used our "three-minute eggs" she immediately asked where she could get them and how much do they cost? I looked at her grandpa and we both rolled our eyes and laughed. He ended up buying her kids yoga blocks for Christmas. Katy’s short 8 years on this planet have already been tough. Her parents have issues with substance abuse and are unable to provide an environment for Katy to grow up in a healthy lifestyle. Thankfully, Katy’s grandparents stepped in (and up) to show her love and support. They are teaching her "coping" skills, thus, introducing her to yoga. I am beyond humbled they turned to me to help with this. I will show her love, guidance, support, and yoga as much as she needs and that I am able to offer. I have also taught her 4 breathing techniques she can access when she feels overwhelmed or upset or too excited: Bee's Breath, Ocean Breath, Alternate Nostril Breathing and Lion's Breath. We had fun doing this and laughed quite a lot too! As a side note, Katy's grandpa is one of my students - and he just took YogaFit Level 1! He also hired me a year and a half ago to teach yoga to his father, who is 89 years old with dementia. I see the great-grandfather twice a week for chair yoga. This means I am teaching yoga to several generations in the same family! I am deeply honored and humbled they think so much of me and my practice of yoga. Katy is an absolute delight. I believe she has taught me a thing or two! 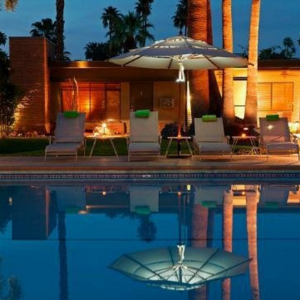 So, how did you become a host with YogaFit? What are the perks? When I first bought Island Lotus Yoga, there was a lady teaching a 200-hour Yoga Teacher Training - it was different from the YogaFit trainings that I had attended. Some of the women were disappointed in their journey and wanted to expand their knowledge and take more teacher trainings. When I took over ownership of the studio, I decided to fill out an application and request to be a YogaFit Host, so that nobody would ever feel that they wasted their money during yoga teacher training again. I have a deep appreciation for YogaFit, the Master Trainers are skilled, educated, quality and always deliver the information. They're personable, loving and now that I've been involved with YogaFit for 10 years, I love you all so much and I feel the love flowing back to me from everyone in this community. We're going into our fourth year as a YogaFit host. Each year we bring in more people for teacher training from further and further away! In December, a gentleman was from Dallas, Texas. I was shocked, "Wow! You came all the way to this little island!" But in reality, 10 minutes to Cocoa Beach does help draw people in, a training and vacation all in one! I've had the wonderful opportunity to be able to retake some classes that I've already had. Although they're the same training, no two trainings are ever the same because the people taking the trainings change and different instructors lead the training - so it's great to observe all these different perspectives. I've also had the gift, as a YogaFit Host, to take other trainings that have helped me progress through my hours. It's been such a gift in my life to be involved with YogaFit - to have goals and a plan, mapped out with things to do for the next year. Recently a friend asked me when I'm going to retire? I have NO intention to retire - I love what I do. Being a yoga teacher gives me a lot of energy for a little gal that just turned 60. How many instructors do you have at your studio? The number fluctuates a little because some of them are snowbirds - they're just in Florida for the winters. The island is pretty seasonal, so winter is our busy time. Currently, we have 4 instructors and they're all YogaFit trained. Did you meet them through the trainings you hosted? Actually, no. One of my teachers used to be a student at the studio - I encouraged her to begin her YogaFit journey with Level 1 and then she decided to continue on. Two other ladies, I'm not exactly sure how they found me, I think through Google. One is from New York, while the other from South Carolina. Within a couple months of each other, they gave me a call and said they wanted to teach at my studio. 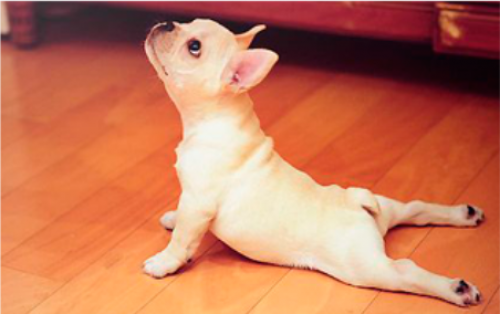 Then they said they were YogaFit trained. As soon as I hear they are YogaFit trained, I know they will be quality yoga teachers. 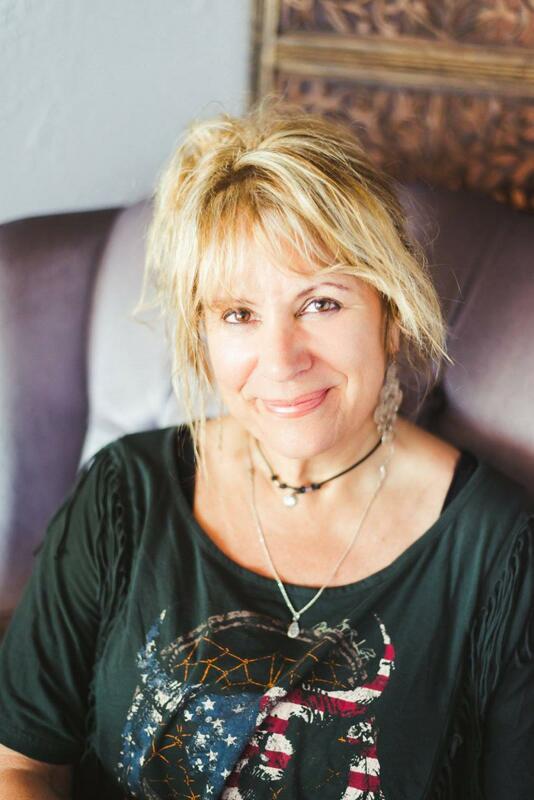 I give people who have taken Level 1 in my studio the opportunity to do their 8 hours of Karma Classes at the studio and begin their teaching journey. As a studio owner, what makes you drawn to YogaFit instead of having your own Teacher Training program? Why do you choose YogaFit? I choose YogaFit for the ability to go at your own pace, as that makes it affordable for a lot of us. Also, the quality of education and the Master Trainers are absolutely wonderful. I feel like we [YogaFit] is the cream of the crop. I don't want to be judgemental, but a lot of other "schools" are not up to the quality that YogaFit is. I enjoy taking the trainings from a Trainer that has the life experience to present this information to me in depth. My demographic, people who like my classes are around my age  and I'm down with that. It's not my goal to be able to do some outstanding postures, I have a plate in my neck, I am very grateful to be able to do what I can. I love helping older adults realized how strong they are and realize that they can do anything they put their mind to - maybe not a headstand, but that's fine, we have other options! YogaFit, in my mind, is the best yoga school in the fitness industry. I love that YogaFit is international and the network that we build amongst each other is so diverse! I have met like-minded people that I will be friends with and cross paths with for years to come. It is so valuable for me to have that support system. There's nothing like walking into a Mind Body Fitness Conference with 200 people and half of them are giving you big hugs! And knowing that the other half, someday I'll be the one giving them big hugs! What does #YogaFitFamily mean to you? Comradery, kindness, love, the love of yoga, and the love of helping other people. Those are all very important things. I was chatting with my MBF roommate earlier about what's going on in the world and how it affects our sympathetic nervous system as a society. As yoga teachers, we have all these great tools to help us handle these stressors, but all the people out there in the world who do not practice yoga are getting sick! There is a flu epidemic because immune systems are so weakened by this bombardment of so many stressors from all directions. We have our health going for us. We can't worry about what's out of our control, but we create a ripple effect with all our energy. By practicing kindness with my class, then they go out with kindness towards others - and it creates a ripple of kindness. That is my whole goal to create this ripple effect within my community. I close all my classes, yoga and Silver Sneakers, with words of kindness. Because we NEED that. There are a lot of words that just aren't that kind. Our YogaFit training helps us look at and perceive everything in a more kind way.